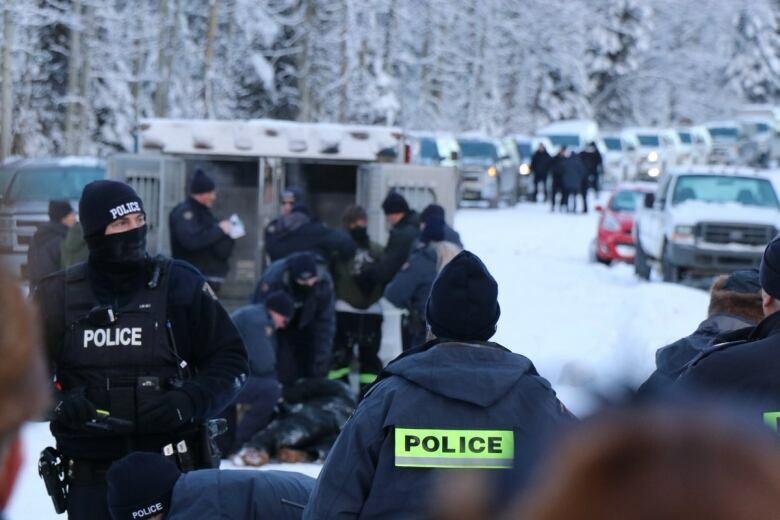 The agreement reached Thursday between Wet'suwet'en hereditary chiefs and RCMP over the enforcement of a injunction was spurred by concerns over the Mounties' use of force on people when entering the Gidimt'en camp on Monday. "We are adamantly opposed to this proposed project and that will never change, but we are here to ensure the safety of our people," said Wet'suwet'en hereditary chief Na'Moks Thursday after the agreement was finalized. 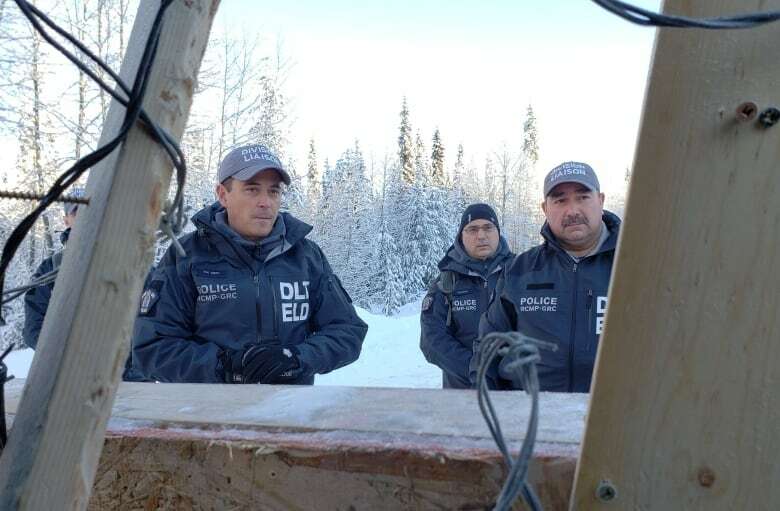 Wet'suwet'en members had set up checkpoints on a remote stretch of forest service road and a bridge preventing people working on a pipeline project from accessing their traditional territory, which sits about 300 kilometres west of Prince George, B.C. The Coastal GasLink project is run by TransCanada Corp. and is meant to move natural gas from northeastern B.C. to the coast, where a liquefied natural gas project is scheduled for construction. A court injunction, granted in December, ordered people to stop preventing Coastal GasLink from gaining access to the road and bridge. RCMP began enforcing the injunction on Monday. As part of their enforcement action, RCMP established an exclusion zone, preventing access to the area by the public and media. RCMP have denied they jammed communications, preventing media and public from providing information about the situation at the camp on Monday afternoon. Molly Wickham, Gidimt'en member and spokesperson for the camp, told CBC the enforcement action RCMP's Aboriginal liaison team had described to them earlier Monday was not what happened that afternoon. "They painted a picture that was extremely opposite of what happened," she said. As at least one helicopter circled overhead, armed RCMP officers, including members of the Tactical and Emergency Response Teams, approached the gate "in force" said Wickham. Some of the people at the checkpoint had locked their arms to the gate. Wickham said RCMP began pulling the gate backwards and the people attached were in danger of being injured. "They had no regard. We were pleading to them to stop what they were doing, that if they continued they would break people's arms, that people were in grave danger. And they didn't listen. They didn't care. They just looked right at us as if we weren't saying anything." She said police were cutting off the barbed wire topping the gate and "it was flying in peoples' faces. People were trying to cover themselves." "They're likely to say people were resisting or being aggressive and we were trying to desperately save those peoples' limbs." She said police climbed over the gate and began pulling people from the gate and pinning them down, multiple officers for each individual. She said they used more force with the men. She said she saw one man thrown down from the gate and he appeared to be unconscious. "I was screaming for him to answer me. I was screaming for someone to check on him," she said. "He was just laying limp on the snow." She describes it as "chaos happening all around." She was not injured. She was arrested and moved out of the way, but said she and other women kept challenging the RCMP with words, asking them "Are you going to continue the violence against Indigenous women on their own territories?" Wickham said she feels they got through to some of the officers as they wouldn't look them in the eye. "They knew they were in the wrong," she said. Rebecca Moore, a Mi'kmaw Indigenous rights advocate and a member of Pictou Landing First Nation in Nova Scotia, was also among those arrested at the gate. "They pushed me from the gate down to the ground and I almost fell off of the bridge into the river," she said. "Thankfully somebody grabbed me and picked me up because there was a lot of people around. I thought that I was either going to get stomped or that I was going to fall into the creek." Moore said she recalls seeing a handcuffed man lying on the ground who appeared to be unconscious, more than one person with arm injuries, and three officers restraining a man on the ground, pushing his face into the snow. "We were not inflicting violence. We were being very peaceful and they were coming at us," she said. "They were pushing us all around." Moore said officers told her she was being arrested because she was breaking "Canadian law," and that in response, she told them they were breaking Wet'suwet'en law. Both Wickham and Moore say they feel RCMP members used excessive force. In a statement to CBC, an RCMP spokesperson said the 14 individuals were arrested and processed through "standard protocols," and that under the law RCMP may use force reasonable to the circumstances to implement the court's order. "The situation was challenging for our members and despite their best efforts to resolve the situation peacefully, arrests did take place," the statement reads. "One of those arrested did complain of a minor injury and was examined by EHS and was returned to the custody of the RCMP. One of our officers also had a minor injury after being hit with a stick." In the statement, the RCMP said the officers' engagement of the camp was documented through numerous video sources and that some of the video content that can be found on social media "clearly opposes" allegations. Following RCMP enforcement of the injunction at the Gidimt'en camp Monday, the hereditary chiefs were concerned about the safety of those staying at the Unistot'en camp and healing centre, where there was another fortified checkpoint. "That will never happen to our people again," Na'Moks said of Monday's enforcement actions at the Gidimt'en checkpoint. After three days of talks with the RCMP, the Wet'suwet'en hereditary chiefs reached an agreement over the enforcement of the injunction. They have agreed to allow the company access to do pre-construction work as specified in the interim injunction for the time being. In a statement, Coastal GasLink president Rick Gateman said the company "is thankful that a peaceful resolution has been achieved and agreement reached that will enable us to proceed with pre-construction and construction activities on our right of way. "I want to personally express my gratitude to those who have supported us through this project process, as well as those who've worked together to achieve a mutually agreeable solution. This is a demonstration that positive dialogue – based on common values of safety, collaboration, and integrity – can create constructive outcomes for local communities and First Nations." B.C. RCMP said the temporary exclusion zone would be removed Friday once access to the bridge was established. But there will be continued police presence conducting roving patrols of the forest service road "to ensure the safety of the individuals at the Healing Centre and of CGL employees." A temporary RCMP detachment will also be placed in the Morice West Forest Service Road corridor. 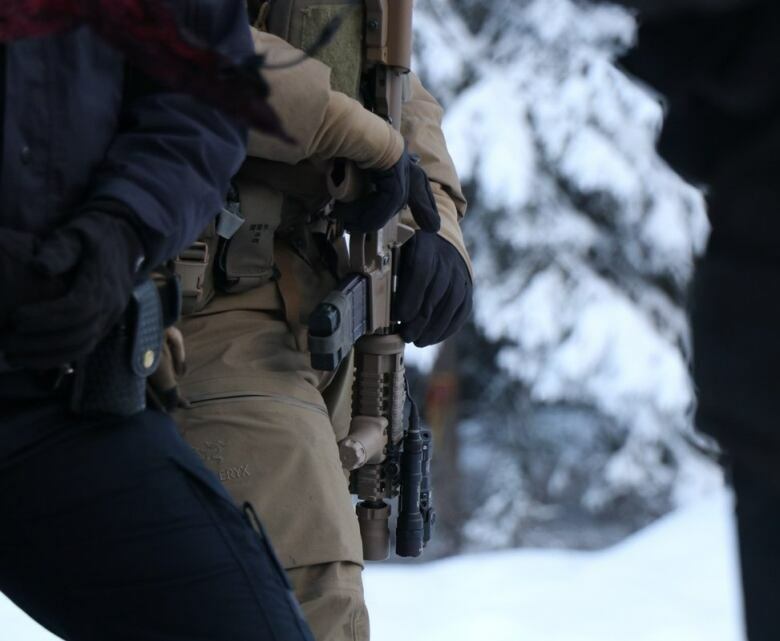 The RCMP said officers there will undergo cultural awareness training on Wet'suwet'en traditions and will have enhanced training in conflict resolution.